Fresco is the Italian word for “fresh”, and that’s because painters do fresco painting on fresh, wet plaster walls. That way the colors really sink in to the plaster, and you get a glowing kind of color that is very different from what you would get if you just painted on top of the dry plaster. People have been doing fresco painting for a long time. The earliest frescoes we know of come from Bronze Age Greece, about 1600 BC. Only about a hundred years later, Minoan painters were traveling from Crete to Israel and to Egypt to paint fresco paintings on the walls of the palaces there. The Etruscans and the Romans also did fresco painting. 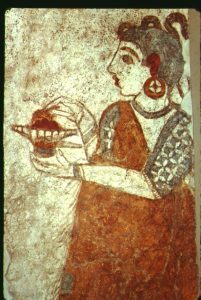 The Etruscans painted frescoes on the walls of rich people’s tombs, showing them eating and drinking in the afterlife. Roman people who couldn’t afford marble walls in their houses often had fresco paintings of marble walls, to make it look like they had marble. Sometimes they painted fancy columns and balconies, or false windows, too. 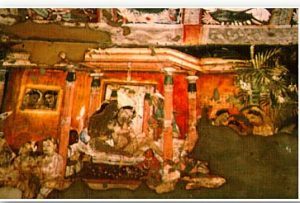 By the time of the Han Dynasty (100 BC), people were doing frescoes in China, and there are famous frescoes from Ajanta, India, dating to about 500 AD in the Guptan period. These frescoes were on the walls of Hindu temples carved out of caves, and they showed scenes from Hindu stories like the Ramayana. In the Middle Ages, frescoes were very popular in Italy. Frescoes were a lot cheaper than the older style of having mosaic pictures on the walls. 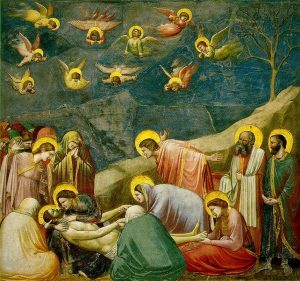 Some famous artists who worked in fresco are Cimabue, Giotto, and Fra Angelico. These painters mainly painted on the walls of Christian churches, and they showed scenes from the Bible or from the lives of saints. In the Renaissance, Raphael and Michelangelo and Leonardo da Vinci all also painted frescos, but after them, in the 1600s AD, oil painting on canvas became more popular, and most artists stopped doing fresco painting. Ancient Greek Art, by Susie Hodge (1998)- for kids ages 9-12. Minoan and Mycenaean Art, by Reynold Higgins (2nd revised edition 1997). The standard book for college students. 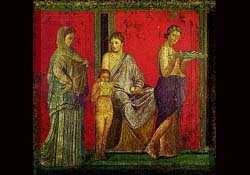 Roman Painting, by Roger Ling (1991). This is a detailed account of the different styles of Roman fresco painting. The Art of Fresco Painting in the Middle Ages and the Renaissance, by Mary P. Merrifield (2004). Cite this page: Carr, K.E. What is fresco painting? History of Art. Quatr.us Study Guides, May 25, 2017. Web. April 17, 2019.